0.1 Picture your Gran Canaria holiday and we’re sure you’re imagining relaxing with a cocktail. And if you relocate here, you’ll discover that enjoying the art of mixology is a popular afterwork appreciation too. 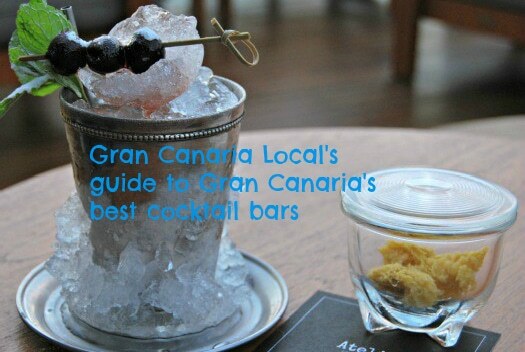 Which leads us to recommend our favourite Gran Canaria cocktail bars. Picture your Gran Canaria holiday and we’re sure you’re imagining relaxing with a cocktail. And if you relocate here, you’ll discover that enjoying the art of mixology is a popular afterwork appreciation too. Which leads us to recommend our favourite Gran Canaria cocktail bars. Histories are notoriously contentious. And it’s no different when it comes to the cocktail. 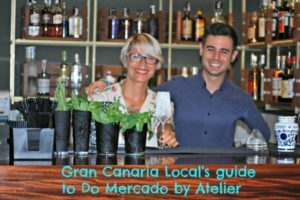 However, our latest guide brings some much-needed clarity to the mixology scene on the island as we share the best Gran Canaria cocktail bars known to us. In capital Las Palmas de Gran Canaria, (new kid on) The Block Café enjoys an enviable Las Canteras location at the westerly end of the beach. Where it joins the altogether more established Mumbai Sunset Bar. Las Canteras’ East End, meanwhile, houses Ocean Bar which creates some seriously fruity concoctions, the already legendary DO Mercado by Atelier, and classicism revivalists Ginger Gin & Cocktail Club. For a cocktail with a view, head to Triana. Whose La Azotea de Benito perched atop CC Monopol offers gorgeous vistas of neighbouring Vegueta. If you haven’t got a head for heights, nearby La Bohême Cocktail Bar on Plaza Hurtado Mendoza keep things varied with cocktails of the month such as a South American Pisco Sour (Angostura bitters, pisco, egg white, lemon, and sugar) for €6,50 and you can see the olde-worlde streets of Vegueta closer up at Calle Mendizábal’s La Joyería Cocktail Bar. If it’s the high life you aspire to though, hit the upper limits of Parque Santa Catalina by jumping into the lift at Bed&Chic and pressing 3. The elevator’s doors will open to reveal the uber-stylish El Tendedero de Catalina. Sufferers of vertigo will prefer the ground-floor Sin Fronteras Gastro&Cocktails, at the opposite end of Calle Luis Morote. Nearby, there’s the easy-to-spot Citrus Cocktail Bar with mixers which are as colourful as its decor. However, if you like your outside seating less on- than off-road, just around the corner there’s Plazoleta Farray’s El Mono Malvado whose house cocktail SkyEmocion (a shaken-not-stirred Martini glass of fresh mint, gin, liquid sugar, lime, and Blue Curaçao) reflects Italian owner Alberto Beraldo’s love of skydiving. Elsewhere, another esteemed establishment with al-fresco space is The Kitchen Tapas & Cocktail Bar on pedestrianized Calle Ruiz de Alda. Other coctelerías of distinction in the Gran Canaria capital include Calle Bernado de la Torre’s intentionally rhyming Un Lugar cocktail bar whose drinks menu is divided into sweet and sour sections. Whilst the former’s Hello Kitty (priced at €5) goes big on vodka and coconut and watermelon liqueurs; the latter’s 6€-costing Mombasa Club gintonic is jazzed up with coriander seeds and lemon. If gin and vodka cocktails are your poison of choice, Calle Joaquin Costa’s El Viajero will mix you up something special. Moving westwards along the GC-2, El Secreto de Arucas‘ terrace, at the end of Calle Dr. Fleming’s spiral up the Montaña de Arucas, makes the perfect setting for a cocktail; particularly on post-midnight closings on Thursdays, Fridays, and Saturdays. Over in Gáldar, meanwhile, despite the name, the drinks menu at Come y Caña is not restricted to half pints of lager ; stretching, as it does, to include cocktails. 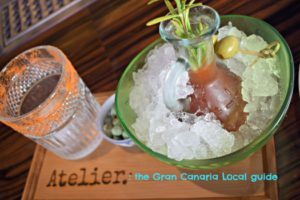 It’s a similar story at neighbouring Agaete‘s Coffee & Wine Bar Los Berrazales with cocteles available as well as café and vino. In Playa del Inglés ascend to Atelier and cocktail heaven thanks to master mixologist Raimondo Palomba whose creative cocktails are the perfect start or end to a night out in the resort. Despite not being open on Fridays, the Eiffel Bar in the nearby Yumbo boasts a cocktail menu that’s the talk of the town whilst The Peppermint’s cocktails are as flamboyant as the absolutely fabulous owners. Heading to the ground floor of the Yumbo, you’ll find Divinity Karaoke Bar: architects of some particularly fruity brews. 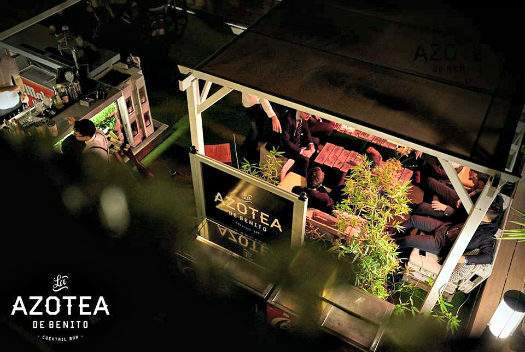 When looking for an oceanside venue, head to number 24 on the Paseo Costa Canaria and Tipsy Hammock Bar whose signature cocktail is the appropriately-named Atlantic Breeze. If promenade bars are your thing, further west Café del Mar in Meloneras is another of our top tips. Where they update the cubata century with their Cuba Libre 2.0 (aged rum, chocolate liqueur, orange liqueur, cinnamon, lime juice, and Coke). Nearby, K1 Food & Lounge also deserves a shoutout for an extensive cocktail menu. Even further west, Puerto Rico‘s Barbacoa Show Bar & Restaurante includes a cocktail lounge in its CC Europa location which opens at 9:00am in the morning. 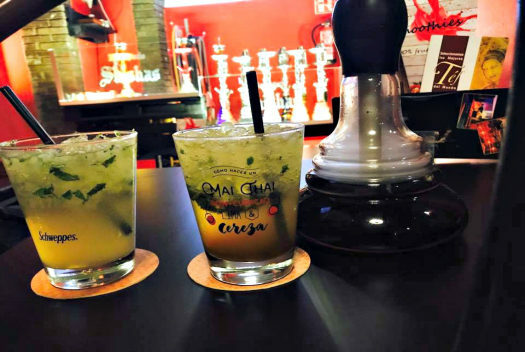 Between Puerto Rico’s beach and CC Olas, Wig Wam Cocktail Bar has been garnering a lot of support on TripAdvisor who have awarded this lively establishment a Certificate of Excellence for 2017. 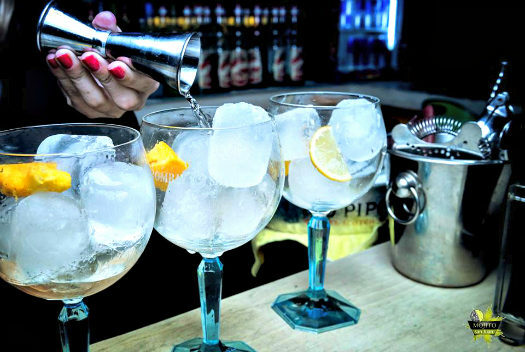 Over in Puerto de Mogán, The Lounge‘s summer sensation is their strawberry gin and tonic. The east of the island’s party capital Telde is home to Oasis Chill Out on Calle Picachos which keeps things simple on the cocktail front with daiquiris, margaritas, and mojitos. 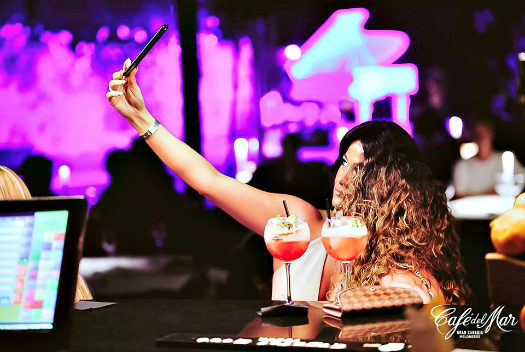 The latter take pride of place on the drinks menu of Mojito San Juan open on Fridays and Saturdays from 11:00am to 4:00pm. Elsewhere, cocktails are one of three beverages Calle El Roque’s El Bosque Encantado by Colegas specialize in: the other two being tea and coffee. In the west of the island, La Aldea de San Nicolás‘ most hip and happening joint is Monasterio La Aldea. 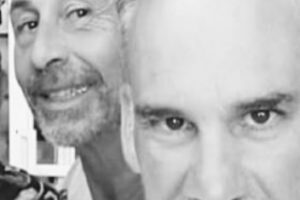 Join the dressed-to-the-nueves‘ locals at a venue offering an ecletic cocktail menu which opens until midnight Tuesday to Sunday. It’s closed on Mondays.